pinkish colour because of the tiny blood vessels under them that keep blood flowing through the cells. Healthy fingernails will grow about 3.5mm per month and toenails about 1.5 mm. Your fingernails are pretty resilient but can be susceptible to a variety of problems and conditions. Watch for nail discolouration such as yellow nails, which could indicate respiratory issues. If discolouration is combined with a thickening of the nail, it could mean a nail fungus is present. Nails that are half white and half pink may indicate renal failure. Nails that turn black, brown or purple without being injured may point to melanoma. If you notice ripples developing it could be an early warning for psoriasis, eczema or inflammatory arthritis. Iron deficiency anemia can also trigger vertical ridges and changes to your nails that make them concave, or “spoon-shaped.” Deficiencies in calcium, zinc or vitamin A can also be the culprit of ridges in fingernails. Horizontal, parallel white lines extending across a nail can be a sign of liver disease or malnutrition. Deep grooves that go from left to right across the nail are known as Beau's lines and could be associated with severe physical stress. Loose nails, not caused by an injury, could sometimes indicate poor circulation. Clubbing is described when your fingertips become enlarged, and the nail grows curved downward. It can be a sign of low oxygen in your blood and is associated with lung disease. Clubbing can also be related to liver or kidney disease, heart disease, inflammatory bowel disease, and AIDS. and aids in the metabolism of protein-building amino acids that are essential for nail growth. An iron or magnesium deficiency can lead to problems with nails. If you have a lot of vertical ridges, consider an Iron supplement such as WomenSense IronSense (not generally required for men’s health). Combining your iron supplement with a B stress product, such as Preferred Nutrition Super Stress B that contains Vitamin B12, Folate and other essential B Vitamins, will help the iron absorption and support healthy nail repair as well. A deficiency in folate (folic acid) can cause a pigment change in your nails and make them rigid and brittle. A Vitamin C supplement helps to play an essential role in the production of collagen (which provides structure and strength to tissues, including fingernails.) 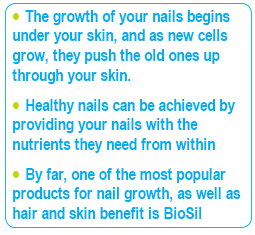 By far, one of the most popular products for nail growth, as well as hair and skin benefit, is Preferred Nutrition BioSil because it helps to stimulate the keratin-producing cells in your body. Keratin is the crucial substance in hair, skin and nails, along with collagen and elastin. 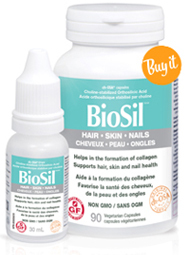 Clinical trials conducted with BioSil showed significant results in strengthening nails, thickening skin, increasing skin elasticity and helping to reduce fine lines and wrinkles. Make sure you choose acetone-free nail polish remover. Wear gloves for better nail care when working with your hands, such as when you're gardening or housecleaning, to protect your nails from harmful chemicals and keep your cuticles healthy. Your cuticles are the protective seal around your nails that keep infection out of the newly forming cells.